You! Be Inspired! – It All Started with the Big Bang! Comedy films and shows are usually defined by scenes that feature a character or a set of characters doing or saying weird and sometimes seemingly stupid things. Individuals like Charlie Chaplin, Mr. Bean, Jim Carrey, Bill Cosby, Kathy Griffin and Ellen DeGeneres have used this style in the past and they were very successful with it. So it came as a surprise when Chuck Lorre and Bill Prady decided to create a series that highlights the lives of two geeky and socially awkward physicists. The Big Bang Theory which was first released on September 2007 was one of the first shows in the comedy genre that presented the world’s science community in a light, entertaining and humorous manner. Although the show revolves around a gang of nerdy characters with presumably uninteresting lives, the ingenuity and creativity of the script and the plot have managed to hook a diverse group of people which is the reason behind the show’s success and continuance. 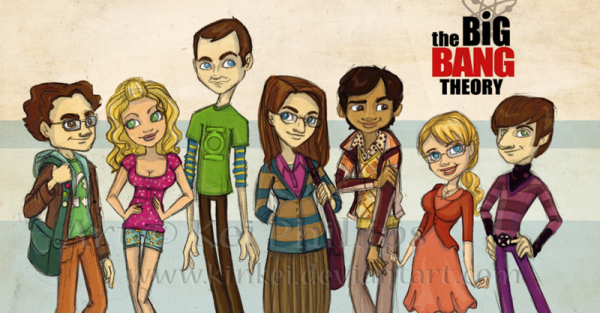 So to all the geeks out there, we’ve assembled a few artworks that showcase the brainy antics of Penny, Leonard Hofstadter, Howard Wolowitz, Rajesh Koothrappali, Bernadette Rostenkowski, Amy Farrah Fowler and of course Sheldon Cooper. “I was expecting applause but I suppose stunned silence is equally appropriate.” – Sheldon Cooper. NOTE: Images on this page are not owned by YouTheDesigner and are used solely as design examples. Please click on the images to see their original sources. Was there any design that caught your eye? Tell us by leaving a comment below. We also have social profiles on Facebook, Twitter and Google+ which you can like, follow or plus one. You can also subscribe to our RSS feeds for the most up-to-date news and features in the world of design. Bazinga!! !